Remote Backups work like regular tape backups, with one important difference. 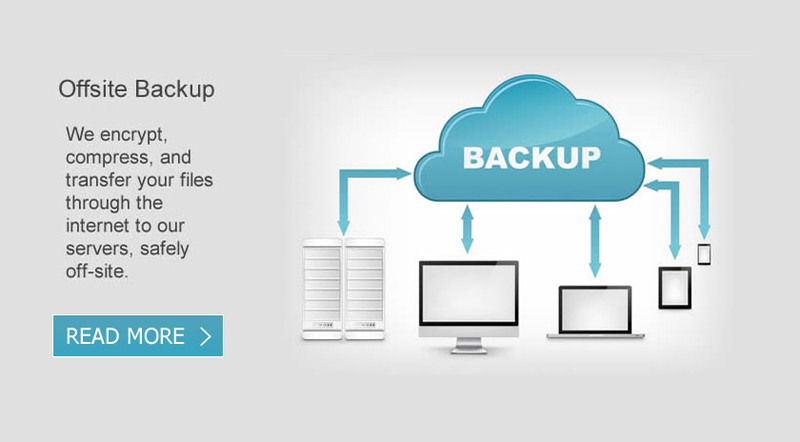 Instead of sending backups to a tape drive or other media attached to the computer it is backing up, a Remote Backup encrypts, compresses, and transfers the files through the internet to server safely off-site. It does this (usually) at night while the business is closed and nobody is using the computers. It’s completely automatic. That depends on the ammount of data you are backing up. The backup software typically will compress to 1/2 a files original size. Plans to protect your data start at the low price of $10.00 a month for up to 20 gigabytes of data. Each additional GB is 50 cents more per month.